Do you love cooking with your instant pot? I do too and short ribs are one of the cuts of meat a pressure cooker was made to cook. 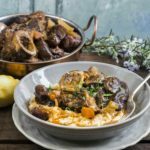 Short ribs take a long time to get tender and delicious but the Instant Pot makes quick work of them. 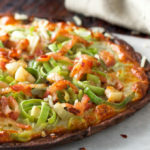 I have upgraded this recipe to include some delicious balsamic onions and sauce as well. If you are low carb or keto you will love these instant pot short ribs! Instant pot short ribs for the win! Full recipe and printable recipe card below. A few notes to help you along the way with this recipe. You start with quite a few sliced onions in a pan with balsamic. I soaked my onions overnight in the balsamic vinegar but this step is optional. I do believe it gives the final onions more flavor, and I was able to cut all the onions the day before which fit into my schedule better. Do what works for you! You cook the onions on the stove at a simmer or light boil to begin the balsamic cooking down process and start to break the onions down as well. I had these going on the stove as I cut the ribs down into smaller pieces as the picture below. Cutting the ribs makes them fit better into the pot and cook more evenly. We will be browning the sides of the ribs right in the instant pot on the saute mode. I find the bottom of the pot slopes a little and the oil ends up pooling around the rim of the pot. I add my oil to the pot set it to saute on the hottest setting and once its warmed up I lay the ribs in with my big BBQ tongs along the edge. I brown 3 edges of the ribs, you are just creating flavor here, but no need to brown all 6 sides of the ribs. I brown for 3-5 min a side. When I turning the ribs you want to press down a bit with your tongs to make sure the meat, which can be curved, contacts the pan so it will brown. You want color like this on your ribs. Once your ribs are all browned remove them to a plate and hit cancel/keep warm on the instant pot. Take the onions and liquid and use it to deglaze the bottom of the pan. This step is important- you take about 1/3rd of the remaining liquid the onions are cooking in and pour it into the instant pot. It will steam and sputter but you need to take a wood spoon and scrape all the browned bits off the bottom of the pan. Do this thoroughly. Scrub scrub scrub! Add the remaining onions and balsamic and then the ribs over the top. Onions in the Instant Pot before the ribs are set in. Let’s get to the full recipe! A delicious and simple instant pot short rib recipe. The balsamic gives great flavor to the short ribs and gives the onions a delicious jam-eyness. Make sure to add the smoked paprika for the smokey flavor too! 2-3 pounds beef short ribs- bone in. Will work with boneless but you will want to reduce the cook time by about 10 min. When ready to cook: Bring a pan over medium heat and add the onions and balsamic. Here you are just beginning the process of reducing the balsamic down and infusing it into the onions. Keep cooking the onions while you prep the rest of the recipe- about 20-30 min stirring occasionally. While the onions cook, cut your ribs into smaller chunks between the bones. This makes sure they cook evenly. Salt them liberally. Heat up the instant pot on the saute setting and add the cooking fat. Use enough to cover the bottom of the pot. Once the oil is hot, place the ribs in to brown. Brown 2-3 sides of the ribs 3-5 min each. I use large BBQ tongs to help me move the ribs around. When the ribs are browned remove them and hit cancel/keep warm to turn off the saute function. Add about a third of the onion liquid to the bottom of the pot and scrub the bottom with a wood spoon. Make sure to get all the brown bits unstuck from the bottom of the pot. Add the remaining liquid and onions to the pot and place the ribs on top. Sprinkle the smoked paprika on the ribs and roll them around a bit to cover them in spice. Set the pot to sealing, and cook on manual pressure for 55 min. When the 55min are up- you can let the pot do a natural pressure release, or you can quick release only AFTER 15 min of rest. If you release any sooner the beef will dry right up! Remove the beef from the pot and some/all of the onion. Set the pot to saute and reduce the sauce down to your desired thickness. I sauted in the pot for 20 min and got a beautiful thick sauce! Serve the ribs with some sauce and onions as desired! I have added calories to the recipe card, but this will vary WIDLY based on what amounts of meat you use in this recipe. 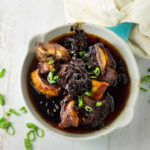 I love love love making these cuts in the instant pot and the addition of balsamic onions takes the recipe from Plane Jane to packed with flavor and personality! I hope you’ve enjoyed my healthy keto Instant Pot Short Ribs recipe!